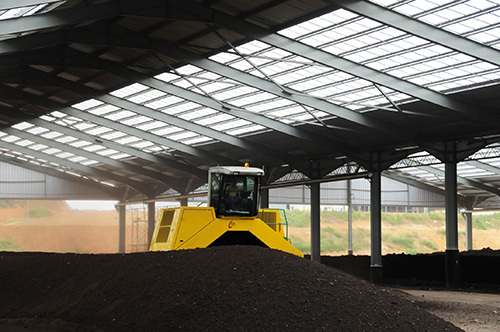 GGS Bio-compost Processing Line is a treatment process, jointly developed by Global Green Synergy Sdn. Bhd. and scientific experts, to convert Empty Fruit Bunch (EFB) and Palm Oil Mill Effluent (POME) into compost. The method is a biological process that utilizes natural microorganisms to decompose the palm biomass, such as EFB and POME, into nutrient rich compost. In this method, EFB and POME are placed indoors and are separated into several windrows and mixed with specially-cultivated thermophilic microbes. Heat, in the form of steam, is introduced into the compost during the process. The steam provides heat to create a conducive environment for the microbes to grow. This technology only requires 28 days to complete the composting process. The system also employs a process that recycles the POME back into the compost until all POME is fully utilized, ensuring zero waste discharge. The technology converts waste into wealth. Together with other GGS technologies, GGS is at the forefront providing effective solutions for the oil palm biomass industry.